I got this idea off of Tip Junkie and it was submitted by Holly. Holly originally found it in a Martha Stewart book, so already I love it. Anyway, this is a homework center and the timing is just perfect. After the girls get home from school each day, trying to get them to focus on their homework and stop farting around is pushing me over the edge. 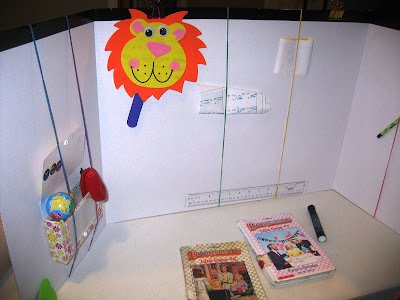 These homework centers are the perfect solution, and they're super easy, and fast, to put together. I was amazed at how quickly they came together. 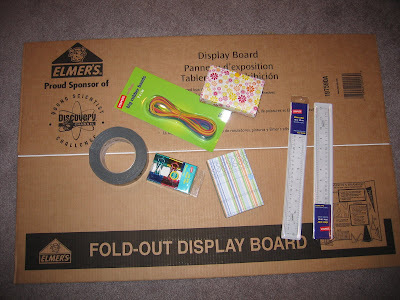 1 large fold-out display board (1 board will make 2 homework centers), duct tape (it comes in other colors besides industrial grey, but we have black), ginormous multi-color rubber bands, binder clips, and an index card box (I got the cute decorative ones at Staples). 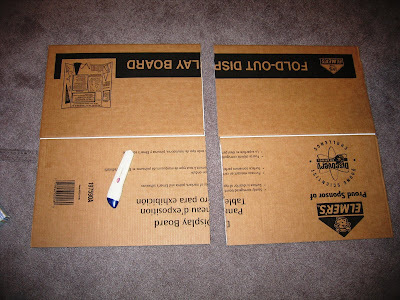 Step 1: Measure the display board twice and cut once, in half, with a utility knife. Step 2: Cover the cut edges of the display board with duct tape. Step 3: Randomly add the large rubber bands around the display board. 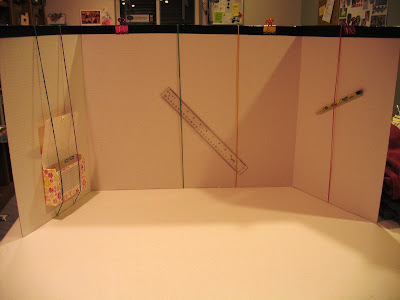 Use two to fasten the index card box onto the board. The rubber bands are great for tucking paper, pencils, etc. into. Step 4: Clip a few binder clips across the top of the display board. These are great for clipping paper as well. 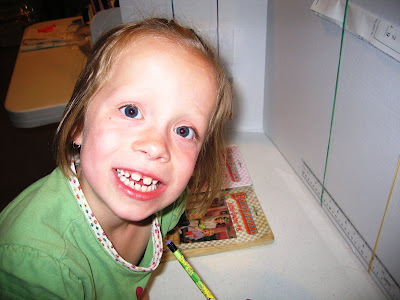 Here's Thing 1, LOVING her new homework center. The girls were so excited when they got home from school and found their new homework centers, that they squealed "Let's play school!" Thing 1 even added some of her own personal touches. Thing 2 got right down to business and did her homework. Recently, both girls were sitting behind their homework centers reading and I could only see Thing 2. I asked her where her sister was and she replied "She's in her box." She was right there next to me and I didn't even know it. How great is that? HaHaHaHa the very creative things you get involved with!!! My 8-yr-old would love this! And spend the first half hour or more decorating it. It would probably get used more for imaginary play than for homework. But 'oh, my' would she be happy to pretend to be doing homework in it! 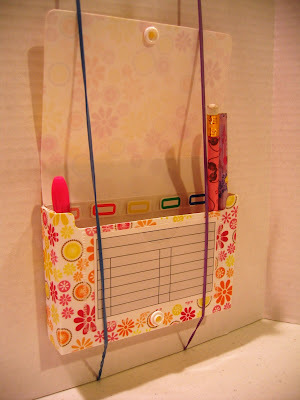 I am going to make one of these for my ADHD child. Right now I've given up my dining room table, but with this, maybe I can get him back in the kitchen! I am going to make one of these for my ADHD child. This will be a tremendous help, and maybe I can have my dining room table back! How many times after school am I telling my son to focus and like you said "stop farting around"!! !lol I LOVE this idea and am going make them ASAP for him and my daughter. Thanks so much for the creative inspiration! Rickie, I couldn't respond to your comment directly because you don't have your e-mail linked to your profile. To store the homework centers, I just fold them up and tuck them behind a bookcase. I have to take the index card box out to do that, but it's easy to slip back in when I unfold them. 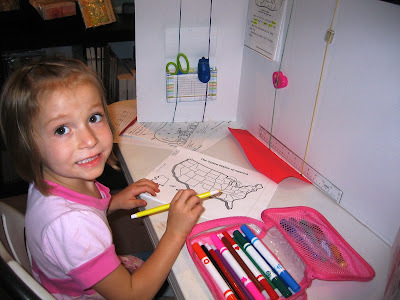 The homework centers are very easy to store.